This premier oceanfront property is situated on the Kohala Coast of the Big Island. 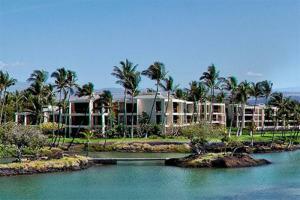 The beachfront condominiums were constructed among a tropical lagoon setting of ancient Hawaiian fishponds. The Terrace is just moments away to the private Beach Club, the Mauna Lani Spa, Sports & Fitness Club and a wide variety of restaurants and attractions. The on-site recreational center featuring a large swimming pool, hot tub, sauna and shower facilities. The condominiums include a full kitchen, washer and dryer, air-conditioning, WiFi and richly appointed furnishings. Located adjacent to the Mauna Lani Bay Hotel.